Set at the confluence of two rivers that almost surround the city, and beneath a temple-topped hill, Luang Prabang is a wonderful patchwork of traditional Lao wooden houses and hints of European architecture; reminders of when Laos was part of the French colony of Indochine. Golden-roofed wats, decorated with mosaics and murals of the life of Buddha, sit under the gaze of wrap-around teak balconies and 19th century shuttered windows. All of this is set against a backdrop of verdant greenery and rugged mountains. One of those small cities with atmospheric and charming personalities, Luang Prabang has topped the Top City category in Wanderlust's annual (popular choice) travel awards several times in recent years (2015, 2012, 2011, 2010). As a visitor, you cannot help but be amazed by the tidiness and cleanliness of perhaps the most charming city in all of Southeast Asia. With UNESCO so closely involved and a largely responsible group of local business owners, the pressures of mass tourism development have been held at bay, but for how much longer remains to be seen. Restaurants along the main street tend to be expensive and aimed at luxury tourists, whilst lower cost venues are along the banks of the Mekong. Luang Prabang rose to prominence as the capital of the first Lao kingdom (Lan Xang - land of the million elephants) from 1353 onwards. The city owes its present name to the Pha Bang, a revered Buddha image (now in the Royal Palace Museum) which was brought to the city by King Visoun during the golden age of Lan Xang in the early 1500s. 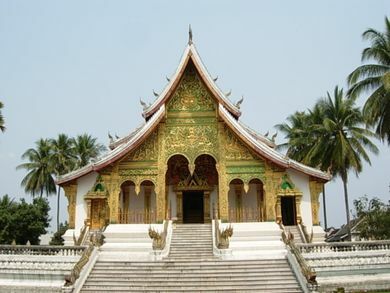 The fragmentation of the Lao kingdom at the end of the 16th century saw Luang Prabang become a militarily weak independent city state paying tribute to the surrounding kingdoms. Ultimately the 1887 sacking of the city by the Chinese Haw led the Luang Prabang monarchy to accept the protection of the French, whose influence led to the construction of the many fine colonial villas that sit harmoniously alongside the traditional Lao architecture. The city fell into decline in the latter half of the 20th century following the reluctant withdrawal of the French, and the 1975 revolution which brought an end to the Luang Prabang monarchy. The relative poverty of newly-independent Laos perhaps helped save Luang Prabang from the ravages of 20th century city planning. 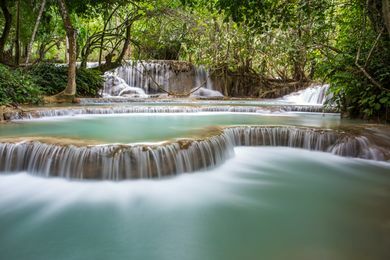 The reopening of Laos to tourism in 1989 resulted in a remarkable turnaround in the city's fortunes, as crumbling timber houses and colonial mansions were sensitively restored and transformed into immaculate guesthouses and boutique hotels. In 1995 the city was placed on the UNESCO World Heritage List. The airport is located just 5 km north-east of the city and has scheduled flights from/to Bangkok, Chiang Mai, Hanoi, Jinghong, Pakse, Siem Reap, Kuala Lumpur and Vientiane. Bangkok Airways offer flights from/to Bangkok. Laos Airlines offers flights from/to Bangkok, Chiang Mai, Hanoi, Jinghong, Pakse and Vientiane. Lao Central Airlines flies daily from Vientiane for around USD60 one-way. Thai Airways has seasonal (October to March) flights from Bangkok. Silk Air offers flights from/to Singapore via Vientiane. Vietnam Airlines offers flights from/to Hanoi and Siem Reap. Vietnam Airlines' pricing scheme is somewhat questionable, with tourists paying higher prices on last-minute tickets. Air Asia offers Flights from Bangkok Don Muang Airport and Kuala Lumpur. The new airport opened in 2013 and is much larger, clean and fairly quiet for an international airport. Visa-on-Arrival is available at the airport. The price is variable based upon your nationality, with USD35 being typical, with an additional USD as "overtime charge". You need a passport picture to obtain a visa. If you don't have one, they'll scan your picture from your passport and charge you an additional 1 USD. Ensure you have USD otherwise you will need to use the ATM outside the front entrance or exchange money at the exchange counter. Exchange rates at the airport are reasonably competitive with the prevailing outside rates, unlike a lot of other international airports. ASEAN nationals do not need a visa to enter Laos for stays not exceeding 30 days, except Myanmar and Brunei which 14 days. Visa extensions are possible at the Immigration Office opposite the Rama Hotel. The price is USD 2/day plus a USD 2 form fee. The process is very easy; turn up in the morning with your passport and one photo; fill in a form (in Luang Prabang they do this for you) and come back in the afternoon for your extension. Taxis into the city cost about USD6, whether you are by yourself or with 3 other people. There is a taxi counter just outside the arrival hall. As of June 2015, you are required to buy a taxi ticket for 50,000 kip per person for a seat on a shared van taxi into the city. There are tuk-tuks driving down the main road which charge about 20,000 kip for one person into the city. If there are a couple of you then you can get a better price. Most guesthouses can organise pickups for about 100,000 kip. Be aware the SIM card salesman next to bag claim will rip you off, your phone will stop working before your plan is over. Use the SIM sales counters once you have exited baggage or buy in town. Highway 13 connects Luang Prabang to Vang Vieng and Vientiane in the south and via Highway 1 to the north. Highway 13 is asphalt and in relatively good shape during dry season all the way to Vientiane. Simply put, it is long, bumpy, and winding road trip. The road resembles of a lunar landscape and there are endless potholes due to poor quality surface, the top layer eroded to reveal the gravel underlayer, which causes a bumpy ride. Though there have been incidents of violence along this stretch of road in the past, presently it is safe. Upon arrival at a bus station, there will be tuk-tuks that will cram in as many tourists as possible for a flat 20,000 kip (10,000 kip after negotiation and pointing to the information panel from the bus station displaying the tuk-tuk fees for the city-centre, Feb. 2015; update in Jan 2018 - they don't negotiate anymore, it's always 20k) to the city centre, which is near the Royal Palace. Many tourists alight here, but if your hotel is not nearby you can request that the driver take you to your hotel at no extra charge, as long as it's within the historic part of the city. There are three bus stations, each a little bit out of the city, which serve different directions. Tuk-tuk drivers know which bus station to go to for which destination. Ask around for bus schedules. Tickets can be bought at every travel agent in the city, which makes more sense than buying them at the bus station as there is only a difference of roughly 20,000 kip, which pays for the the tuk-tuk from place of accommodation to the bus station (45min walking for southern station, 55min for nothern station), so it nullifies the gain. Pick those agencies which absorb the shuttle ride from the fare quote as others do not. Compare first before biting the quote. Book tickets in advance, particularly for "VIP" buses as they have reserved seats, and you don't want to end up sitting next to the toilet. If you have a preference for aisle or window seat, ask for a seat before the toilet (i.e., between the toilet and front of the VIP bus) where the seat numbers are predictable. The seat numbering jumps a couple seats after the toilet (which is located in the middle left of the bus), and what should have been an aisle seat number becomes a window seat number and vice versa. Boats ply the Mekong to and from Huay Xai at the Thai border, stopping in Pakbeng where you can catch overland connections towards the northeast and the border with China. The trip takes 2 days (both days about 9 hours) by slow boat, or 6 bone-rattling hours by speedboat. There are also operators now offering 2-day "luxury" cruises. Expect to spend the night in Pakbeng if you're taking a slow boat (the safest option), or to arrive in Luang Prabang deaf, shaken and either exhausted or exhilarated from six hours in a speedboat. If you leave Huay Xai in the afternoon you can get a speedboat to Pakbeng (~3hrs) and join the slowboat from there, this might save you a night in Huay Xai. There is also a twice-weekly "one day comfortable boat" between Luang Prabang and Huay Xai, but the cost is significantly higher. Slow boats leave every day, the last one at 11:00 (if there are enough people [who are slow getting through Laos immigration] boats will leave up until approx 12:30). The trip from Luang Prabang to Huay Xai costs at least 220,000 kip. As opposed to the numerous travel agencies in town the official tourist information and the actual boat pier ticket counter will provide you with the current official price for the boat ticket and departure times. The trip to Luang Prabang from Huay Xai costs around THB1000 /220,000 kip or 110,000 kip to Pakbeng (2015). If you take your bicycle on the boat it will be transported on the roof of the boat and will cost 25,000 Kip from Luang Prabang to Pakbeng and the same from Pakbeng to Huay Xai (2015). If you don't buy the ticket via a travel agency (which will likely cost you up to 100,000 Kip more) but directly at the ticket counter you can only buy the ticket to Pakbeng. The next day you will buy your ticket from Pakbeng to Huay Xai directly on the boat. If you have booked your boat trip via a travel agency, be sure to retain your ticket stub as they check again when you board again at Pakbeng. Make sure you stock up on food and drink before traveling as the on board prices are practically double (20,000 kip as opposed to 10,000 at a restaurant). Many guest houses at Pakbeng sell small, but somewhat pricey, packed lunches for the onward journey. In Huay Xai take a tuk-tuk from the border crossing to the boat landing (10 km, THB100 per passenger) and purchase your tickets at the boat landing because all the tour agencies in the city charge a commission, and agents usually don't have reliable information about the quality of the boats. It is common to have to switch to a different boat in Pakbeng, so you may end up in a boat of higher or lower quality for the second half of the journey. The two day boats have nice comfortable car seats, and so it is no longer necessary to purchase any cushions. You can buy a Huay Xai to Luang Prabang ticket from Huay Xai guesthouses but at the Port you can only buy a ticket to Pakbeng. When you board the Luang Prabang boat after the night in Pakbeng, a registered ticket seller will come around checking 'through' tickets and selling tickets for that day's travel to LP. The slow-boat is generally packed, so much so that there may not be enough seats to go round. If you insist before leaving, plastic chairs may be added for the benefit of the unlucky late-comers. Arriving early will mean a longer day, but most likely a better seat, towards the front and away from the incredibly loud engine (maybe take ear-plugs just in case). The best seats are located near the captain as they allow access to large open 'doors', however, this area can get cramped with locals and their belongings or alternatively with shouting, Samsong-drinking party-backpackers while the few locals are shoved in the back. The slow boat trip proceeds at a pleasant 20-30 km/h and offers nice views to the nature and village life on the banks of the Mekong river. Most of the passengers are foreign tourists. Occasional locals take the boat only for short hops between the river side villages, but prefer to take the bus for the full distance from Huay Xai to Luang Prabang. So you won't be able to observe many local boat travelers, the boat ride offers just the usual sight of tourists drinking Beerlao but is a great way to meet other tourists and discuss route plans and travel info or get very sick of them. Previously the slow boat stopped right in the middle of the city. But now the official slowboat pier is ~7 km out of the city and everyone is then forced to take a tuk tuk. If you do not wish to participate in this you can gather a group of people and start walking to the city on your own (turn right from the boat landing). The tuk tuk drivers will follow you and within 50 m the price will drop to 15,000 kip per person. Walking a little further will probably drop the price even more since in about 250 m you will come across a busy road (turn right to go to Luang Prabang) where it should be easy to get transport. If you do not find transport on the road itself then there is a petrol station about 500 m further where there are always tuk tuk drivers filling up. When you disembark the slow boat it is a very steep combination of stairs and earthen bank to the road. A tourist fell backwards with the weight of her backpack and broke her leg in May 2015. You might be approached by a tout offering to take you into the city for a very inflated price. What he's doing is very dishonest as he will carry your backpack to the road and then demand payment, and then you still have to buy your 20,000 kip tuk tuk ticket at the office on the road to get into the city. There is an agency (Bo-Sapphire) in Huay Xai which offers trips from Chiang Mai to Luang Prabang. Tickets which are sold by local agencies and hotels in Chiang May include minibus transfer to Chiang Khong (Thai bank), border/Mekong crossing to Huay Xai and the slow boat ride as described above. Tickets are collected by the driver when you enter the minibus in Chiang Mai and you will be left with no proof of payment and services included. The minibus will drop you at a very dirty "hotel" in Chiang Khong with damaged buildings, urine-stained bedsheets, and disgusting meals. Consider walking around the city to find a better place. If you book the "B" package which includes accommodation in Pakbeng you will find that breakfast, lunch package, and transfer to the pier is not included although you paid for it but are not able to prove. Phone numbers and email address displayed on the company's stand at Huay Xai immigration counter and on their buses are defunct. So you cannot contact them. If you choose to travel on the speedboat (a light canoe with a very powerful engine), a crash helmet and life-jacket will be provided, but once you have taken the trip you will realize they are mostly show only and will not help you if something goes wrong. Regardless, it is not recommended you travel in a speedboat without this safety equipment. It is also recommended that you make your bags as waterproof/water-resistant as possible and wear a rain jacket. The boat can generate quite a bit of spray, plus any showers you might encounter along the way will sting like needles against any exposed skin. On sunny days, sunscreen is invaluable as there is no roof/shade on these speed machines. The journey to Huay Xai can be reduced to as few as 4 hours in the wet season, with a lunch stop at Pakbeng. However, some consider this means of transportation less safe, especially in the dry season when boats travelling at 80 km/h come within a few metres of exposed rocks. Earplugs are strongly recommended. Those concerned about their environmental impact may want avoid speedboats, as they are heavier polluters than the slower options. Speedboats run on LPG with boats stopping regularly to get supplies (8 bottles required per trip) and it is not overly comforting to the weak-hearted to have two full bottles at the front of your boat as you negotiate 3 m diameter whirlpools to avoid m rocky outcrops almost close enough to touch. Travel agents in Luang Prabang will sell the tickets for 320,000-370,000 kip, you will need a minivan to take you the 10 km north to the fast boat pier. Unless you're an adrenalin junky, look for other transport options. The third option is to take a "luxury" cruise. The major operators are Luang Say and Nagi of Mekong. Both operate two-day cruises to Hauy Xai that stop in Pakbeng for the night. A third player, Shompoo Cruise, has now entered the market. Although the journey takes as long as taking the slow boat, these operators offer vastly superior facilities and equipment than public slow boats, and you should be prepared to pay a premium for it. Tickets for all three operators can be bought at most travel agents in the city. Prices are approximately 220,000 kip for a slowboat (50,000 for bicycle transportation), 280,000 kip for a speedboat. 3,000,000 kip for Luang Say, 1,200,000 kip for Nagi of Mekon and (both including a night in a hotel) and 640,000 kip for Shampoo. There are reports that prices for Luang Say and Nagi of Mekong can be bargained down. There is no public boat service to Vientiane, but it may be possible to do the trip by private tourist boat when the water levels are high enough. Read more about fast and slow boats in the Laos country guide. 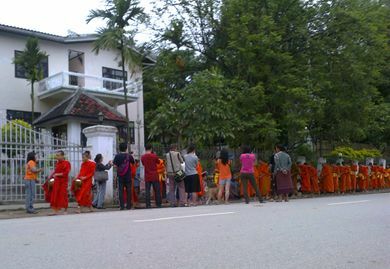 Alms Ceremony, Sisavangvong Road, Luang Prabang, taken from across the street in early May 2011. Pha Tad Ke Botanical Garden —  Laos' first botanical garden has a plant collection of over 2000 species, with the aim of preserving Laos' biodiversity, educating the local community, and providing a top rated sustainable tourism destination for visitors. A half day visit gets you a boat ride down the Mekong,access to the garden, a tea tasting, an optional one hour hike to a cave, orchid and garden history talks, and a bamboo handicraft session with a local expert. Unwind from your visit by enjoying top rated Laotian fusion food at the Pha Tad Ke cafe. For 200,000 kip, the price may initially seem high, but given all that is included people end up leaving satisfied with their investment. The office is on the Mekong, close to the post office. ☎ +071261000. Hours: 08:00-18:00. Alms ceremony — monks at dawn (05:30) collecting alms of rice from kneeling villagers and tourists, who form the majority, along Sakkaline Road near Wat Sensoukharam. Just look for the long row of rice baskets and stools that have been laid out for tourists who have paid for the privilege of giving alms. Seeing these tourists, who make up the majority of the alms-givers, seated on plastic stools participating out of fun rather than sincerity definitely reduces the authenticity of the moment. To make things worse, some are dressed inappropriately: please, if you want to give alms, at least cover up and do not show the monks your cleavage. If you are white, please keep a distance from the monks so people can take authentic photos without a European backpacker getting in the way. Ask your guest house host to assist you the day before in preparing if you'd like to get up and give alms in the morning. Please note that the alms giving ceremony is one which, while picturesque, is not without its detractors. Unscrupulous local merchants have used the eagerness of tourists to participate in a local tradition as a means of making easy money, and sometimes sell unsuitable, stale and even unsafe food. This has resulted in monks falling ill after having consumed the offerings, and resistance to continuing the tradition. However, the government has made it clear that the monks have to continue the tourist pageant or risk being replaced with lay people clothed in saffron robes in order to keep up appearances, and thereby maintain tourist revenue. So if you wish to participate in this ceremony, prepare the food or fruit yourself, and avoid giving food of unknown quality. Another problem is the photography: while it looks nice on your collection, think about how it must feel for the monks to have hundreds of tourists photographing them every day. Some lowlifes even stand right next to them, flashing them in the eyes. Strongly consider only watching this old tradition from a distance instead of using it as a tourist attraction, as this may detract from the beauty of the ritual - both for locals and tourists alike. You can always download a picture of it somewhere on the net for your collection. Haw Kham — the former royal palace and now national museum, 30,000 kip, no photo/video/bag/shoes allowed, free locker. Open 08:00-11:30 and 13:30-16:00 every day except Tuesday. There's also sometimes local drama or dance performances in the adjacent theatre. In August 2011, on Mondays, Wednesdays, Fridays and Saturdays, there were performances at 18:30 of "Search of Princess Sida", a royal ballet, with prices from 80,000 to 150,000 kip. It's important to check the timings and plan the visit accordingly. Phou Si/Chomsy Hill — the main hill in the city from which you have a good view of the whole area. It's not a very steep climb from the bottom and sunrise and sunset are the most sensible and rewarding times to go up. There is a near-panoramic view from the top. There are 2 entrances from ground level: 1 on the north along Sisavangvong Road, facing the Royal Palace, and another one on the East, on Sisavang Vatthana Road. The northern entrance has about 130 steps up to the ticket counter, and another 190 steps to the top. Even folks with low fitness levels should be able to complete the climb, although it can be tiring for the unfit. The eastern entrance is longer than the northern one by a factor of 2 or 3, and is hence less steep and has more points of interest along the way, which are perfect excuses for stopping for a breather on the climb. Entrance fee 20,000 kip. Sunset on the waterfront — take a walk along the Mekong, or sit and enjoy dinner at one of the many restaurants and watch the sun sink into the horizon. If having dinner, make sure to bring some mosquito repellent or wear long trousers. Mosquitoes love stationary targets. Vat Xieng Toung — the oldest monastery in the city and one of the most beautiful. Opens from 06:00-18:00. Entry fee 20,000 kip. One entrance on the road along Mekong river, the other on the by-lane off the main road. Vipassana temple and park — this golden temple, highly visible from Phou Si, is a shrine for Buddhists who practice Vipassana meditation. Vat Khili, Vat Sibounheuang, Vat Sirimoungkhoun Sayaram, Vat Sop Sickharam — small cozy nice temples. Really great atmosphere of real temples. Located near Vat Xieng Toung. No entrance fee. Garavek Traditional Storytelling Theatre A small black-box theatre performing a selection of traditional Lao stories - legends and folktales of Luang Prabang. The stories are told in English, with the live musical accompaniment of khene (a traditional Lao instrument), every evening at 18:30. You can buy tickets before the show. Traditional Arts and Ethnology CentreA small but perfectly formed museum dedicated to the ethnic cultures of Laos. Find out more about the groups that make Laos unique and so enrich your visit to Luang Prabang. Located at the foot of Phousi Hill behind Dara Market. Sometimes closed for exhibition changes, so please check in advance. Open Tuesday - Sunday from 09:00 to 18:00. Closed Mondays. 25,000 kip entry. Weekdays in the afternoon and on weekends you can use the playground of the ABC International school. They might charge a fee. The pool bar 'La Pistoche' has nice toddler-pools. They charge 30,000 kip per person (also for the children) and you leave a 50,000 kip deposit for consumption. They are open from 10am. 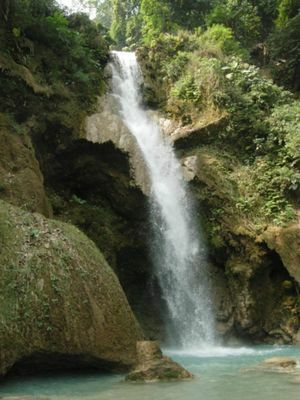 The Kuang Si Waterfalls have right below to upper basin some small basins which are handy with small kids. Also there is the 'Big Brother Mouse' project which stands for 'A book for every child'. It is a small library and they have some toys to play with. Also they sell books for Lao-children which you can give away later on your trip and support education with this. This is an enjoyable way to gain insights into Lao culinary methods and traditions. There are three substantial cooking class providers in the city, all attached to popular restaurants, using Lao chefs/instructors. They differ somewhat in style and content, but all start with a tour of the local food market and include transport and copies of their recipes and other information about Lao cuisine. Participants sit down to eat their dishes afterwards. The Terrace is a restaurant overlooking the Nam Khan river and they offer private classes anytime of day in their outdoor kitchen. For USD35 you choose 4 dishes you'd like to make, includes a market tour and recipe booklet. Restaurant located on Kingkitsalat Rd (Nam Khan river road), Ban Khili, in front of [ Burasari Heritage]. Contact details: ☎ +856 71 213331. Tamnak Lao is situated in premises to the side of their main-street restaurant. They offer both day and evening courses (10:00-17:00, 250,000 kip, & 17:30-20:30, 200,000 kip). ☎ +856 71 254670. For day classes, there are 2 mandatory plus 5 optional dishes to choose from (choose only 3) for a total of 5 dishes plus demonstration only on how to cook sticky rice and Lao chilli paste. Variation is not much as 4 of the 7 dishes presented require eggs. Instruction is no-nonsense and very fast paced but Mr. Lee, the instructor, is very helpful if you need help. It starts with demonstration then hands on. Tamarind: a taste of Laos has a restaurant along the Nam Khan river, but you are taken to and from the rather lovely gardens by the water a short ride from the city for their classes (09:00 to 15:30, 250,000 kip). Contact details: , ☎ +856 20 77770484. Bamboo Tree, formerly Tum Tum Cheng, is now located on the Nam Khan river beside Tamarind. Offers a half-day course for USD38. Classes have more of a demonstration orientation, with participants helping instructors with various tasks. ☎ +856 71 252019. All courses can be booked at the relevant restaurants. Some of the hotels and guesthouses in the city also offer small or private cooking classes for their guests. Residence Phouvao, 5 star hotel. Visit the market, and assist the cook with a couple of recipes in the garden of the hotel. Hotel de la Paix, 5 star hotel. Visit the market, and learn a couple of local recipes. Amanataka, 5 star hotel. Learn and cook on a "back to roots" kitchen, located in a rice field (Living Land). Living Land Farm offers a "Rice Experience" Tour, or you can just stop by this farm, which is right outside of the city on the way to the waterfall. If you stop by without a tour, they will still show you around the farm, pointing out the organic vegetables and rice and showing you the traditional tools they use to process rice. Contact details: . Thai baht and US dollars are widely accepted but the exchange rates vary. There are some ATMs accepting Visa, MasterCard, Maestro and Eurocards. These ATMs are situated mostly in Sisavangvong Road near the end of the Night Market. The ATMs dispense currency in Lao kip and some of them (such as Banque Franco-Lao) allow a maximum withdrawal of 2,000,000 kip with a charge of 40,000 kip. BCEL ATMs allow 1,500,000 kip with a charge of 20,000 kip. Multiple withdrawals are allowed to a daily maximum of 5,000,000 kip. If you arrive by plane, there is an ATM and a money changer at the airport which is open for a few hours of the day, so don't count on changing there. Also, their rates are significantly worse than the banks in the city. For Malaysians, it is best to change money to baht, where the rate is MYR10 = THB100 or more, then change the baht to kip in Laos. This is because they give not so good rates in Laos for Malaysian ringgit. There are a number of money changers who generally do not offer good rates, and are located either on Sisavangvong Rd or in the permanent markets further east. One is next to the ATM near the Night Markets, another is about 50 m further north along the street, located out the front of one of the first restaurants (looks like a little tollbooth). The rates offered may vary, so shop around before you change. It maybe better to stick with official money changing services at a bank which are easily found. There are reports of scam by using money changers to take cash advance. They will charge you more in US$ with different exchange rate than written, and even after complaining it's not possible to cancel the transaction. Beware also of money changers giving you 1,000 kip notes instead of 10,000. The notes look similar. Also, beware of Vangmisay Money Changer in Ban Choumkong. Always remember to count your money in front of the money changer immediately after the transaction. Avoid Vangmisay at all costs. The Night Market (on Sisavangvong Road) caters to tourists with every kind of souvenir you could want and closes at about 22:00. Particularly good are the duvet covers, cushion covers, and pillow sets. They will custom manufacture one to your dimensions in one day. It is well worth a look and the hawkers are very pleasant to deal with and amazingly non-pushy by Asian standards. Traders range from young children to the elderly who usually make the items they sell. Good-natured bargaining is advisable, but don't obsess over this and ruin your experience as well as giving the trader a bad day. It should be understood that the quality and design of goods is lower in the market than in the legions of increasingly chic shopss in the city. There may well be some souvenirs available made from endangered animals. Avoid buying rare pets, leather, ivory, talons, dried sea creatures (starfish, etc. ), fur, feathers, teeth and other products. Same for the lao lao whisky bottles with scorpions and snakes. This is the best place to buy lower end souvenirs and hone your bargaining skills. Several book shops sell photocopied books, and so it's worth checking the copies as pages can be unreadable or even missing. Also, such copies may be illegal in your country. Book Exchange The Tamnak Lao Restaurant no longer offers a book exchange, and it was slim pickings at L'Etanger. In Feb 2018, the best place in town to exchange foreign-language books was at Novelty Cafe, at the start of main street. It's a 1-for-1 exchange plus $2 that is donated to a local literacy program. All books are also available to purchase. Public Library During lunchtime, which is around 12:00 to 13:30, the dry summer sun can be scorching. To spend time comfortably while waiting for the sun to mellow at around 15:30, hang around at the public library across from the national museum about 4 or 5 buildings along. Travelers can't check out books, but you can read them here. There are many books about local sites and customs, Lao cookbooks, art books with local links, etc. You'll also find English language newspapers issued months ago still in circulation. Or surf the net for free from the six Internet stations. Movie Night at L'Etranger L'Etranger tea shop shows English-language movies nightly on a widescreen TV in their big upstairs space. A sign out front lists what movies they'll show for the coming week. The movie is free, but a purchase of a drink or food from their regular menu is expected (in Feb 2018, drinks start at 12k, but 20k+ is more common; food from 25k and up). Movies start at 7pm, but it's wise to go earlier to find a seat and place your order, as popular movies pack the house. There are no McDonald's restaurants or any other multi-national fast food outlets in Luang Prabang, or elsewhere in Laos. Restaurants line Sisavangvong Road and the roads along the Mekong and Nam Khan. Food runs the line from standard SE Asian backpacker fare to more traditional Lao dishes, including buffalo sausage, right up to very high quality French cuisine. There are also numerous market stalls for cheaper food, including baguettes, crepes, and pancakes. Stalls along an alleyway between the night market end of Sisavangvong Road and the Mekong offers superb Lao street food at bargain prices. The much recommended street-food market located east of the Tourist Information building as posted on PBS Gourmet.com, said to be one of the must-see street food markets in SE Asia is quite disappointing though. A dozen or so buffet dishes per table-stall is offered at 15,000 kip (as of February 2015) per plate. They are displayed in aluminum basins with no warmers and by the time it's 20:00, the food is cold (however most vendors are more than willing to heat up your food in a wok, after which it's a lot more palatable). The taste is also bland, nothing outstanding or super noteworthy more than any indifferent buffet offerings in other parts of the world. Also, one must contend with a barrage of flies. Basically, if one sees one table, one has seen it all. However, there is large range of salad items and because everyone is packed into the tables to eat, it is a great way to meet other travelers. While the buffet tables are the cheaper way to eat, be wary of the hygiene and note the distinct lack of local customers which is an indicator of the standard of food on offer. You'll never encounter fatter flies elsewhere in SE Asia. For a bit more, a tasty alternative are the grilled fish, chicken legs, and buffalo sausages sold just before the main "buffet" area. Delicious and worth every overcharged kip. Even tastier if you are tired of fried rice from the dozens of cafes that have sprung up on every corner. A large Beerlao should not cost more than 10,000 kip, and 8,000 kip for the small dark variety, pretty much standard throughout the country. Most riverside places offer the same prices for beer and generally the same foods. Prices of food can vary wildly, though. Shop around and don't be shy about asking prices directly if anything is unclear. Probably the one dish most recommended is the Lao version of fried spring roll: vegetarian at 3,000 kip, or pork at 5,000 kip per piece. The bundles of dried seafood snack have a texture is like chewing salty paper. French baguettes and other bakery items. Local watercress, which is very peppery. Fried dried seaweed with sesame seeds dipped in a chili sauce. Hmong Night Market (vegetarian & vegan) - One food stall says vegetarian and the other "végétalien" (vegan). Approximately 5,000 kip for a plate. Popular with budget visitors but not an option for those looking for tasty food. Cash only. Eat at your own risk as hygiene standards are questionable. Market is open 17:00-22:00. Le Banneton - Opposite Wat Sop, Sisavangvong Road. Authentic French bread, tarts, pastries and cakes. Their pain au chocolate (13.000 kip) is buttery and delicious. The tarte citron and the flan patissier (17.000 kip) are divine. Housemade ice cream available. Prices are in the upper range but you get what you pay for. Cafe Ban Vat Sene - Located on the main street abit aside from the crowds. Open daily from 6h30 to 23h. Homemade pastries, Artisanal Ice-cream and large selection of Asian Soups and European dishes available anytime of the day. Wifi, Aircon and Exhibition Art on the first floor. Newspapers to peruse and books to purchase. Saffron Café - (around the corner from L'Elephant restaurant in Wat Nong village) - Excellent coffee that's sourced from the surrounding mountains, and active in fair trade initiatives (like planting 5 bushes with every purchase of beans). Prices in Jan 2018 included latte 20k, french press 30k, specialized brews available. The banana shake macchiato is also recommended. Delicious fresh baked goods such as their cinnamon swirls and banana muffins go quickly. The granola and salad wraps are good. Decent wifi and multiple comfortable seating areas, including a wooden counter seating across the street with views right over the Mekong. Big Tree Café - (next door to Saffron) solid coffee and very good teas and iced teas. Good wifi (for here). Very comfortable seating inside, with lovely photographs taken by the owner, and outside in a gorgeous garden. Very kind staff. A full menu available -- more info in restaurants section below. Scandinavian Bakery- Serves Western quality breakfasts, burgers and pizzas. Food must be paid for before eating. Delicious Italian-style pizzas. Shakes & Crepes- a no name place serving delicious shakes for 5,000 kip and fantastic sweet crepes starting from 7,000 kip. In front of Croissant d'Or on the main street. Novelty Cafe - bright, design-forward cafe at the start of main street. Good latte (20k in Feb 2018), a range of baked goods, an excellent vegan baguette with grilled veg and hummus and a side salad (38k). Very clean bathrooms, for customers only. The best place in town in early 2018 to exchange or purchase books (Tamnak Lao doesn't have books anymore, and L'Etranger was very slim on pickings) - a 1-for-1 trade plus $2 that gets donated to a local literacy program. Khao Soi Noodle Soup - across from Wat Sensoukharam, between Scandinavian Bakery and Le Banneton. Excellent soups at breakfast and lunch. Two choices: Khao Soi or Noodle Soup (choose beef or pork), both 20.000 kip in Feb 2018. Lao-style khao soi is very different than Thai; a wide rice noodle soup with a big dollop of pork bolognese on top. The plate of greens served alongside every soup is gorgeous on its own. Xieng Thong Noodle - Behind XT temple toward the end of the peninsula on the main road. Cheap and cheerful minus the cheerful part - service is efficient, turnover is quick. Basic hearty noodle soups, 12k for pork or egg only, 14k for pork and egg, in Feb 2018. The fried garlic on top is a great addition. Most inexpensive soup places close up at noon, but these guys are open til 14hr, so a good later lunch choice. Delilah's - Chao Fa Ngum road, Two blocks from post office.across the street from Vat Hosian Voravihane. Delilahs offers fair prices, delicious food, and monthly specials- head on up to the second floor for comfy seating. English spoken and polite attentive service. Big Tree Cafe - Consistently well-prepared Western food and authentic Korean food. Next door to Saffron cafe on the Mekong River road. Good service and free Wi-Fi. Very comfortable seating inside or in the gorgeous multi-level garden outside. L'Eléphant Restaurant- The first restaurant of Luang Prabang, a old-fashioned french cuisine venue with a selection of Laotian dishes, Homemade pastries and a large selection of wine to pair. Phonheuang Cafe - on the same intersection as Garavek theater. A very good and inexpensive cafe, great value. Very good Bun Bo, Pad Thai, etc. Mains 17.000-20.000 kip in Feb 2018. Family business, very nice server. Lao Lao Garden - Attractively designed bar/restaraunt notable for its Lao-style barbecue, in which you and your friends cook pre-prepared meat on a barbecue mounted in the centre of the table. A backpacker favourite and becomes busy in the evenings with loud club music. If you prefer to cook your barbecue in an atmosphere of quiet contemplation there are other BBQ options along the riverside. Nava Mekong Dining Cruise - Nava Mekong is the exquisite dinning cruise of Luang Prabang. Dining on the on the side of the mighty Mekong is a recommended thing to do when visiting Luang Prabang. Grass Flower Lao Coffee Shop - on the road that leads from main street down to the upstream bamboo bridge, down from Cafe Toui. A good inexpensive choice for local and pan-asian food. The pork laap was really kicky and full of flavor. The charming owner speaks French and English and is lovely to chat with. Rosella Fusion Restaurant - Clean and well-cooked food. A small place (blink, and you'll miss it) that looks like a fruit shake place. Locally owned by a Lao who trained at Amantaka Restaurant. Possibly the best steaks in the city, certainly great cocktails. Slow service, but worth it. Tamarind - On the banks of the Nam Khan river next door to Apsara, specialises in introducing Western tourists to Lao food, so the dishes are offered with explanations and the menu is full of information. Traditional Lao food in sampler format. Platter combinations of dips,salads etc as well as set menus. Only a small wine list but good range of fruit drinks. Popular cooking classes in a garden setting. Sells food products, recipe books etc. There are a number of places to drink around Luang Prabang, though the late-night club scene is pretty much nonexistent. The liveliest and busiest bars are in a small cluster between Mount Phousi and the Nam Khong. Luang Prabang's status means that curfews are strictly enforced here: bars start winding down at 23:00 and close at 23:30 sharp. The only permitted late-night options are outside the main part of the city: a discotheque patronised mostly by locals and a ten pin bowling alley. If you do plan on staying out after hours, check the arrangements with your guesthouse first to avoid being locked out. If you're simply looking to relax and enjoy the river views, most riverside restaurants have tables outside where you can sit back with a beer or two. Books and Tea L'Etranger - downstairs is a book shop/swap and upstairs is a bar selling drinks and cake in a room covered in cushions for lazing around and reading. Movies everyday at 19:00. A tad greedy and unfriendly on the book exchange business. Definitely overpriced. They even charge you for reading one of their used books on spot. The Bowling Alley Changed its location to stand close to the Chinese Provincal Hospital, 2 km out of the city. Serves Beerlao and whisky well into the early hours of the morning to a raucous backpacker crowd, and also happens to be a bowling alley (20,000 kip per person per game after midnight). Even the addition of lanes doesn't seem to have dented the emphasis on drinking. This is invariably reached by crowds of people sharing tuk-tuks, which cluster around the bottom end of Phousi Rd around the time the bars close. Mekong Sunset Beach Bar - The place to go to watch the sunset. Located at the river mouth of Nam Khan and Mekong, you have to cross the bamboo bridge behind Wat Xieng Thong and walk 3 min. Very simple but unbelievable. Floods in the wet season. Luang Prabang has the best selection of accommodation in Laos, with something to suit every budget. There is everything from tent sites under a roof for 20,000 Kip per night up to super luxury hotels at USD1,500 per night. Don't expect all the facilities that can be found in Vietnam or Cambodia - aircon, cable TV, internet - in Luang Prabang for USD12. While the big chains have yet to make an appearance, there's plenty of "boutique" accommodation, although this heavily overused word runs the gamut from quirky to luxury. Most of the lanes and alleys all through Luang Prabang have places to stay, with a large selection also found in the lanes south of the Post Office. Free Wi-Fi is quite commonplace in Budget guesthouses. Sengphet Guesthouse. Located in the very centre, can be found on maps(google, maps.me). Very nice and clean. Free bananas, coffee, tea, WiFi, toiletries. Own by nice and friendly Lao family. Prices for double: fan shared bathroom 100,000 kip; fan private bath 120,000 kip; A/C private bath 150,000 kip. Bicycle rental 15,000 kip. Buses and tours tickets. Prices for January 2017. Chitlathda Guesthouse has two parts with decent clean twin/double fan rooms 70,000 kip (December 2014 Highest Season), and 3-bed A/C rooms 90,000 kip (August 2014). Free Wi-Fi and water. Also have few desktop computers for internet use, 10,000 kip/hour. Halolao Backpackers, 222 ban that luang. basic clean rooms with fan, cold and warm water, good window mosquito nets. Staff is friendly and helpful. Free coffee and tea in the morning. Free Wi-Fi in lobby and sometimes in rooms (bad coverage). Double room with bathroom for 100,000 kip per person. A bit hard to find, near to NamPhou, behind of Suvarnaphoum Hotel, in front of Muong Thong Hotel. If you come from main road Sisavangvong Road, leading the way to Joma Coffee, passing by this coffee shop and then you will see Suvarnaphoum Hotel and Nam Phou, turn left into the second small street count from Suvarnaphoum Hotel main door, and you will see Halolao backpackers after 2 minutes walk. Levady Guesthouse in a lovely side street 50 m off the main street, great central location. Nice family, wooden rooms and floors, bike rental, wifi. Beds are comfortable, heavy blankets could be cleaner, bug screens & shutters in non-glass windows. Hot water & water pressure was great in the single room; less reliable in one of the doubles. Double rooms with private bathroom 100,000 kip with fan, 120.000 kip with use of AC in Jan 2018. Single room with private bathroom and fan 60.000 kip in Jan 2018. Mala Dressmaker & Watthat Guesthouse. This is a traditional Lao-style home which has 3 rooms upstairs and 3 rooms downstairs most with self contained bathrooms. Free Wi-Fi, drinking water. Price is 50,000-120,000 kip per room. Washing 8.000k/kg, coffee, breakfast. There is a dress shop in front where you can have clothes made, repaired or modified. 30 m walk down to Mekong river,if you walk up to watthat temple turn left two block to night market. Ban watthat village, house n: 2/15 Wat That Road. email: [email protected] Ph:+856-30 5171506, +856 71 254859 or Mobile +856 20 55671180. Mojo Cafe and Guesthouse, offers rooms for 2-3 people with air-con and Wi-Fi included in the deal. The cafe plays hosts to jazz and blues every night from 20:45-22:30 and provides a classy, upbeat environment to listen to have a glass of wine or a the classic tall-boy of Beerlaos. Phasith Guesthouse Rooms from 150,000 kip a night for a large room with air conditioning (January 2017). Rooms feature an en suite balcony. Located right around the corner from Utopia Bar, Lao Lao, the Hive lounge Bar in the upscale nightlife area. Five minutes walk from the Night Market. Free Wi-Fi, free coffee/tea. The large almost verandas make it decent for what you pay, but better value and service can be found elsewhere. Phousi 2 Guesthouse, situated on the river, Chunkham Road, close to boats pier. Clean, owned by nice local family. Double room with AC and private bathroom 150,000 kip. Prices as for January 2017. Sean Sa Ngop Guest HouseBasic double bed rooms with hot shower, fan, sky TV, mosquito net. Have the school on your right hand side. (School near the Dara Market) then take the first right turn and walk down. Bounchaleurn Guest House on your right hand side (it's a landmark). 60,000 kip for the double room. Somjith Guesthouse (856-71) 252 756; (856-20) 7777 4883; Email [email protected] Clean room, attached, or shared bathroom, fan or air-con, free Wi-Fi (but a bit unreliable sometimes), laundry service 8,000 Kip/kg. Clean, private room with 2 beds, ensuite bathroom, air-con, fan, cable/satellite TV is 100,000 kip per night (July 2014). Oudalon Guesthouse 4/4 Ban Thongchalern, 300 m south of Dara Market. Phone 856-71212500. Formerly LemonLaos and SpicyLaos Backpacker. Basic double rooms starting from 80,000 kip (Feb 2017) Free (very slow and spotty) Wi-Fi. The building is an old-style two-story affair, with wooden floors. Sysomphone Guesthouse  (+856-71) 252-543 Located in Banvisoun 22/4 street, off Vatmou-Enna Rd. Have the Lao Development Bank on your left, walk straight till the T-junction, turn right, then take the second left into the small street and Sysomphone is at the end. Has a good view of Nam Khan River behind the guest house and is just around 10 min walk to Sisavangvong Road. Friendly and helpful family/owner. Free bananas, water and Wi-Fi. Owner has good information, prepares free dinner once a week for guests, has sticky rice if you stumble across dinner, collects guests' photographs in an album, and shares his knowledge of the Lao people and the country if asked. Rooms with shared hot-water bathrooms 70,000 kip. A newer, cleaner building in the back has fresher rooms for 100,000 kip (January 2017). VannaPhone Guest House located 10 minutes away from the airport and about 4 minutes from the city. Ranging from US$10-US$15 (depending on what room you choose). Acceptably sized rooms with fairly small bathrooms. Noisy if you choose the rooms located close to the street but if you choose one of the new back rooms it is OK.
Vong Champa Guesthouse. centrally located in a small alley on the Mekong river front near the night market, quiet and spotlessly clean. Double is 150,000 Kip now w/bathroom attached, not so clean anymore (January 2017). Cold River Guesthouse. A French couple took over this place in 2015 and renovated it. The cost is now $35 per night for a double bed (January 2017). It's directly on the Khan River. Free filtered water and bananas are available. On Saturdays they'll serve free home-cooked dinner. Amantaka Set on a large garden estate, Amantaka is housed in graceful French colonial buildings just south of Phousi Hill. Airy and elegant throughout, the décor and furnishings reflect the city’s French colonial history. Rates from USD850 per night. Ancient Luang Prabang On main street next to night market. No room numbers - names like "tiger room". Rooms not quite up to standard for this price - no shower curtain and cleverly designed taps to ensure a wet floor (bath and shower located in the room itself). However clean and comfortable. Friendly staff and no charge for airport transfer. Wi-Fi is free in the hotel and downstairs cafè. Kiridara. Beautiful hotel on the outskirts of the city, with views overlooking Mt Phou Si and the hills surrounding Luang Prabang. The relatively large rooms offer very comfortable beds. The infinity swimming pool has great views, and sometimes masseuses from the spa will offer complimentary 5 minute massages to people lounging by the pool. The spa itself offers a range of massages and herbal steam baths. Small gym onsite. Double rooms start at $112/night. La Residence Phou Vao. Amongst the city's prime hotels, this resort nestles amongst landscaped grounds and gardens, and has picturesque views over Phou Si and the city. The property has a traditional Lao spa and a restaurant offering both indigenous and French cuisine. Regular shuttles are provided and boat trips arranged. An Orient-Express Hotel. Les 3 Nagas Hotel. a nice colonial hotel with 7 rooms on one side and 8 on the other. The restaurant is fairly cheap, but the rooms are rather overpriced. There are a few executive suites, the most costly coming with their own set of stairs. But beware: your nights may be troubled as there is a cockerel that sings every morning at the hotel at about 03:00. Mekong River View. A beautiful boutique hotel with a personal touch, located on the tip of the peninsula, at the very end of the old town, on the UNESCOs World Heritage Area. The view you have from the rooms and Café/Restaurant is the meeting of great Mekong River and Nam Khan River. The hotel is quiet and peaceful with the beautiful former Royal temple Wat Xienthong as your neighbour. The Grand. an atmospheric set of comfortable neo-colonial buildings on the site of Prince Phetsarath's old residence. Many rooms have idyllic views of both the Mekong River and the hotels gardens and ponds. Located around 4 km from the city (a regular shuttle boat and bus service runs for guests), this hotel is enables the discerning tourist to escape from the hum of the city. During the winter season, breakfast is served outdoors on a terrace with spectacular views of the Mekong River and the surrounding hills that emerge from the morning mist. Villa Le TamTam, . Superior Guest House conveniently located in a quiet street just a minute walk from the city centre. Excellent service and peaceful atmosphere. Full breakfast included. $US55-80. Villa Maly. Another Luxury Boutique Hotel in Luang Prabang. Villa Maly was a former Royal Residence. The property is a blend of traditional Laotian architecture with echoes of its French colonial past. Internet and Breakfast included. US$190-300. Kamu Lodge is in a remote location on the Mekong River north of Luang Prabang in an ethnic Kamu village and offers sustainable and socially responsible tourism accommodation. Motorbike rental Recently there have been (Sep 2013 ­and Jan 2014) multiple reports of rental scam in Luang Prabang where the rented scooter is stolen in the city by the renter, be warned about it. Take your own lock and do not leave your passport as a deposit. Monk Alm Ceremony Scam A scam operates during the early morning alms ceremony preying on unsuspecting sleepy tourists. When watching the procession of the monks, beware if one or several Lao ladies approach you encouraging you to give food to the monks as they walk along the street receiving alms from Buddhist pilgrims. The Lao ladies, who aren't themselves Buddhist, will give you a mat, and rice to give to the monks. (The rice is often poor quality and disrespectful to the monks). When the ceremony is over, they will take you to a nearby temple and encourage you to bow to a shrine or statue of Buddha, and then ask you to pay for the rice they gave you. They can insist on receiving very large sums of money before letting you go. If you want to give to the monks, it's best to ask your hotel to organize it for you, but if you aren't Buddhist, it is respectful to watch quietly from across the road and refrain from participating. Night Market Vendor Scam Vendors in the night market will often change the price of goods once they have money in hand. (ie. 14,000 becomes 40,000 etc) Be sure to reiterate the price when haggling and always pay with exact change. Tuk Tuk from Slow Boat pier If you try to bargain the price for the Tuk Tuk to the city please make sure to pay the exact amount or to make sure other people saw the banknote. They can try to give you less change. We saw this happen to a family with small kids. Bottled water is more expensive than other South East Asian countries, but still cheap by western standards. Expect to pay 3000 kip for a small bottle or 5000 for a large. To reduce plastic waste, you can refill your bottles as you go along from your hotel's/guest house's or tour agent's office water dispenser. If you can't find one along the backpacker's area, go to the lobby of the Phra Lang Phra Lao, a separate building besides the National Museum, beyond the huge King Sisavangvong statue, and re-supply. The water dispenser is at the righthand side at the far end of the corner from the entry door. There is also an available toilet with no charge. Or ask at any shop or agent. There are a number of pharmacies in town. Bouaphan Pharmacy (on the main Sakkaline road, across from the primary school, near Cafe Ban Vat Sene) offers a wider range of medicines than most. The pharmacist there is very friendly, speaks English and can offer basic help and advice. See a doctor, of course, for anything serious. By boat on the Mekong to Pakbeng (slow boat 110,000 kip as of 11/2016), Huay Xai (slow boat 220,000 kip June 2016) and then cross to Chiang Khong in Thailand. The slow boat pier is ~7 km, or 20 minute tuk tuk ride, away from centre - just behind the airport. Scam : smaller look alike small boat will claim they are the small boat going to Pakbeng for 110 000. When you arrive in the morning they will ask you 60k / person kip to go to the pier for a 10 minutes boat ride (the boat driver will say that it takes 40 minutes). Fly direct to Siem Reap in Cambodia, Hanoi in Vietnam or Chiang Mai and Bangkok in Thailand. You can buy the ticket to Hanoi from a tour agent, or you can walk to the Southern Bus Station (30 mins walk) and buy it yourself for cheaper. You shouldn't buy the ticket at the station itself, but opposite the station you'll see some buses waiting and there will be an office of the Naluang Travel Company. They are the ones that operate the buses, so if you buy anywhere else the ticket will be more expensive. Also note that they claim to sell a ticket to Hanoi at the Northern Bus Station and for only 150,000 Kip, but this will take you only until the border and then you'll be left at the mercy of the local drivers who can charge you any amount, since you're in the middle of nowhere. Don't mistake the Northern bus station with the Southern. It is preferable to buy tickets to next destination, say Vientiane at tour agents (12-hr trip and not 9-hr as what agents are touting, a total of 13 hours including the 1-hour meal time and as quoted as of Feb. 2012 at 150,000 kip for a seating bus and 165,000 kip for a sleeper bus - both include air-con and meals). For seating buses, there is no built-in toilet and so it's advisable to go before the journey as the stop-over at the restaurant is 4 hours away, and the last, the destination station. Check though, because not all tour companies offer free pick-up from a passenger's residence in the quote price. The southern is about 3 km away from the tourist area, and tuk tuk costs about 20,000 kip. The northern bus station is about 5 km. When on a night trip to Vientiane, it is preferable to bring along a neck pillow to lessen the impact of the rough trip. Nong Khiaw minivans with hotel pickup cost 65.000 kip from agencies. Cheaper (40.000 or 55.000 kip) when purchased directly at the north bus station. Note that boats no longer run from Luang Prabang to Nong Khiaw because of damns on the river. Chiang Mai - this new bus direct to Chiang Mai started on 20th January 2012 and costs 1,200 Baht one way. The journey is via Udomxai and Luang Nam Tha before being transported across the Mekong by boat and continuing to Chiang Mai. Total journey time is 18 hours. From 2013, the bus will use the new Thai-Lao Friendship Bridge from Huay Xai to Chiang Kong and the fare will rise to 1,500 Baht. Vang Vieng - the air-conditioned so-called VIP bus costs approx 150,000 kip, and is the same price as the Vientiane bus. Mini-buses leave from Vang Vieng at 09:00 and cost 100,000 kip. Your guest house should charge no more than 110,000 kip for a minibus pick up directly from the hostel, saving a tuk-tuk to the station. The mini-bus station is just north of the city. As of nov 2016 the minibus station is south of the city. There are two bus stations, if you decides to go on your own you need the one most south/east. The trip takes 6-7 hours (not the 5 that travel agents advertise). Route 13, along which the bus travels, passes through the mountains and twists and turns uncomfortably for most of the journey. This is not a trip to make on a full stomach or if you are feeling queasy. Vientiane - air-con VIP reclining seats bus costs 150,000 kip while air-con VIP sleeper bus costs 165,000 kip if booked through an agent. VIP bus takes 11-12 hours, not the 9-10 hours claimed by many dishonest travel agents. Hotel pickup 1 hour before departure is usually included, but do double-check. Express bus (no aircon) bought at the station is at 110,000 kip. Tickets purchased in Vientiane to Luang Prabang are more expensive than those purchased in Luang Prabang. The bus follows via routh 13 south is a relentless bumpy ride because the road is curvy and potholed. Comparing pluses and minuses for VIP sleeper/VIP seat to Express for night trips, not much difference. At night there is no need for air-con, and it will be unlikely you can sleep, even on a sleeper bus because of the shaking and rattling as the bus drives along rough, rocky roads. Those prone to motion sickness should know (or better avoid) that this trip travels a winding, mountainous road. Muang Xay - takes about 5 hours. Costs 40,000 kip and points onwards, such as Luang Namtha, is done by public minibus only. Big backpacks are carried on the roof. Reservations are usually not necessary, just take care to go early in order to secure a good seat. Luang Namtha - takes 8-9 hours and costs 90,000 kip. Direct local bus via Muang Xay at 09.00. Otherwise take bus to Muang Xay and change there. Nong Khiaw - 3 hours away by public bus from the Northern Bus Station. From there boats connect to scenic Muang Ngoi Neua. Huay Xai - up to 15 hours away. Public buses leave at 09.00 (arrive 12 midnight) or 17.00 (arrive 08.00, normal sleeping bus, not sleeper). Costs 135,000 kip. VIP buses leave on alternating days, tickets purchased at the Northern Bus Station will cost 35,000 kip less than those purchased at an agent in the city. Phonsavan - bus takes about 8 hours and costs between 95,000 to 105,000 Kip leaves Southern Bus Station around 8.00am. The public bus stops at Phou Khon around 13:00 for lunch. Minibus takes around 6 hours and leaves at 09:00. You can take a tuktuk from the city centre (around 15,000 kip) to the bus station for the public bus. You can also buy your ticket at your guesthouse and arrange to be picked up and taken to the minibus station (140,000 kip) You can stay on the minibus until it unloads the local people in the centre of Luang Prabang though tuk-tuk drivers may try to make you get off earlier at the bus station. The south bus station is located approximately 3km from the city on Road 13 , just after the stadium and the Chinese Market. facing to it there is a BCEL ATM, and a second private bus station- Naluang Travel Company - from there the minibuses depart - and you can buy a ticket. Try to not buy a ticket at the station but get on the bus and barter with the driver's assistent. 110,000 kip for a local bus is a rip-off, especially if you just want to go half the way to Vang Vieng. This page was last edited on 5 March 2019, at 09:16.